Known as “China’s Hawaii” (or “Russia’s Florida” depending on whom you ask), Hainan Island is probably China’s best-known tropical resort destination. Golf, tennis, swimming and dining at hotel buffets appear to be the most popular tourist activities, but more and more visitors are also coming to ride waves. Surfing Hainan Open’s venue Riyuewan (Sun and Moon Bay) is a 90-minute drive from the resort enclave of Sanya and is China’s top surfing destination. Brendan Sheridan, owner of local surf shop Surfing Hainan and the organizer of the surfing competition, explains why surf riders should come hang ten on the southeast part of the island this winter. Hainan is a popular winter retreat for those from colder climes, particularly mainland China and Russia. Although in summer the south swells do provide ride-able waves, the water is a bit too calm for experienced surfers (though a great time for stand-up paddleboarding or surfing beginners). The best time to surf Riyuewan is from October to March when the northeast swells deliver the best waves of the year. The Surfing Hainan Open has been held in the autumn and winter for the past four years and the first Association of Surfing Professionals (ASP) tour event in China was also held this past October — the Swatch Girls Pro China Women’s World Longboard Championship, won by Australian Chelsea Williams. Free from the crowds, Riyuewan is an ideal beach to get your feet wet surfing. You don’t need to be a world champion like Chelsea Williams to enjoy Riyuewan’s surf break. Waves do occasionally reach overhead but are usually comfortably waist-high. And Riyuewan’s location away from the crowds at Dadonghai, another main beach resort in Hainan, means you don’t have to surf in constant fear of crashing into innocent bathers, as Russian transplant (and novice surfrider) Oxana Solovyeva notes. Born in Taiwan and raised in Hawaii, Sam Lawn knows his way around the waves. He’s competed in the Surfing Hainan Open on several occasions. Today, as a busy Beijing-based executive at a social media company, he doesn’t get to ride his board as often as he likes. "I don’t get to surf as often as I’d like to, and when I do, I don’t want to spend all day paddling out,” says Lawn. If you’ve got the desire (and the budget) to be pampered in the lap of luxury after a long day of chasing sets, Le Méridien Shimei Bay Beach Resort & Spa is one of the finest hotels on Hainan Island. But for true beach bums, there’s only one option — camping on the beach. Experienced surfriders will see better swells in Riyuewan from October to March. Of course we wouldn’t be talking about Riyuewan at all if it weren’t a beautiful vacation destination. As Sheridan puts it: “Nature designed the perfect surf spot with Riyuewan — a tropical surf spot framed by a lush green headland and plenty of coconut trees, with year-round waves suitable for all surfers." Riyuewan, like much of Hainan, has undergone fairly rapid development in recent years, which included the controversial tearing down of Mama’s Restaurant, a casual open-air dining spot popular with surfers. The beach’s evolution has its detractors. "What was once a pristine surf spot offering a tropical island feeling, is now hundreds of square meters of asphalt parking lot, mixed with numerous multi-story cement buildings and apartment blocks,” laments Christian Ras Hafeez, CEO of Gravity Cartel. "The true origins of this surf spot have been washed away by Chinese commercialization,” Hafeez adds. In spite of potential shortcomings, with the best amenities for surfers and as the only Hainan beach to hold an international (or any) surf competition, Riyuewan is secure as the top destination for surfriders in China. However, local resident Justin Tiller notes that much of Hainan’s east coast is full of great places to catch waves during the winter. Surfing Hainan Open 2011, December 3-4, starts 8 a.m., Riyuewan Bay, on the main left-hand point break. About a 15-minute drive from Riyuewan, the five-star resort features private villas and escalators which take guests to and from the beach. The three-star hotel features basic clean rooms and most convenient access to Riyuewan surf break as well as swimming pool for guests. 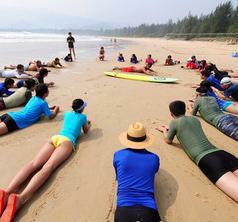 As the oldest surf shop in Sanya, Surfing Hainan offers gear sales and rentals as well as surf lessons and tours in Dadonghai and Riyuewan. The store is on a nameless side street, click here for a map.